in celebration of love, we're excited to help one loving couple get two steps closer to their dream destination wedding. Win a romantic 3D2N vacation for two at Bali's most romantic spot that presents a tropical sunset view & calming ocean breeze for a perfect getaway! Win a romantic 3D2N staycation for two at this exclusive 5 stars all-villa resort! Start 2018 right by embracing the healthy lifestyle at Fusion Maia Resort, Da Nang. VERTEX VR is giving away a VR Wedding Video worth HKD$20,000. Enter the prize draw to win a chance to capture your lovely wedding in an immersive, 360-degree, virtual reality. Join now! To ring in the holiday season, Hitchbird offers you the chance to win a romantic pre-wedding photo shoot holiday in either Auckland, Queenstown or Wellington in 2017. Join now! TAIPEIROYALWED is giving away a Taipei wedding photography package that includes hair & makeup and dresses & suit rental valued around USD$1,150! Join now! 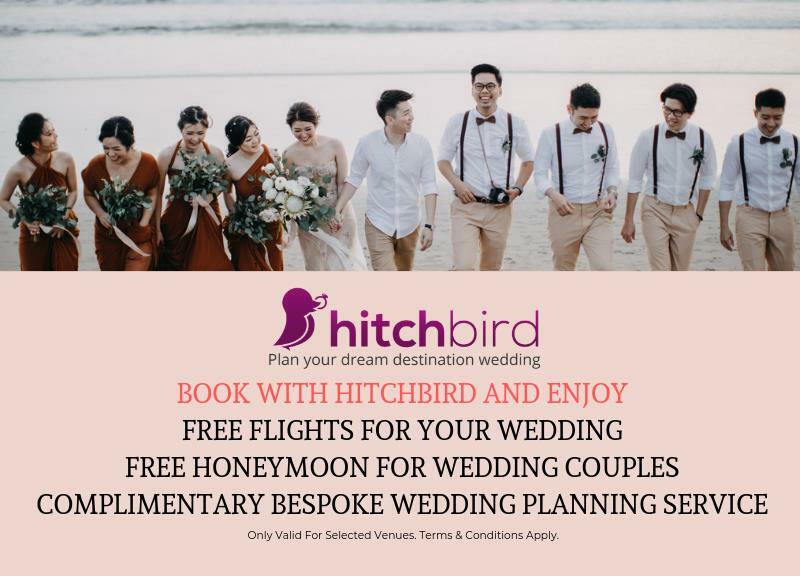 Hitchbird kicks off this summer with a HUGE wedding giveaway with 30 fantastic prizes up for grabs, including a pre-wedding photoshoot in Macau + makeup + room nights at Studio City, Macau! by telling us your favorite romantic destination!